We’ve been talking about price increases and low inventory for months, so this week we thought we’d revisit some data and provide an update on inventory supply in SW Florida. 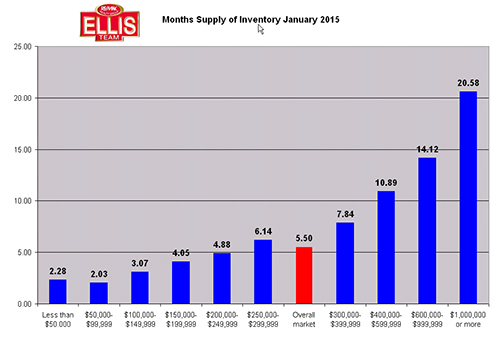 Back in January we analyzed the supply of inventory and compared it to May of 2014. Since January there have been some changes. All price ranges of inventory supply fell except one. The $600,000 to 1 Million range actually increased from a 14.12 month supply back in January to a 16.64 month supply today. The overall market stands at 4.52 months compared to 5.5 months back in January. Anything less than 6 months is considered a seller’s market and the overall market certainly qualifies for that. In fact, anything up to about $400,000 is a sellers market and up to about $600,000 is a neutral market. Once you start getting up over $600,000 there’s more competition for the buyers as there are less buyers and more inventory available. For instance, back in January there were 579 homes on the market priced between $600k-$1 Million. Today there are 807. That’s a 39.38% jump in inventory. Thankfully we had 90 more sales in the past year in that price range which helped offset the large jump in inventory or the months supply would have been larger. It would have jumped to 19.68 months were it not for the increased sales. Otherwise listing inventory pretty much dropped across the board. In the $100,000-$150,000 price range listings dropped from 721 to 457 while sales actually increased in that price range. 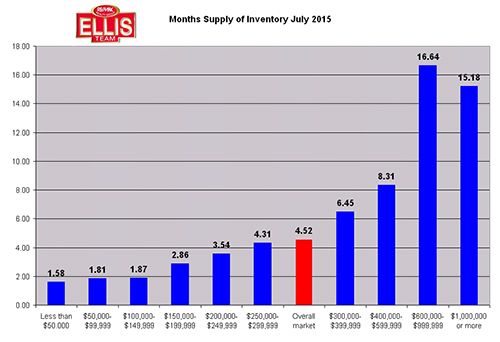 Hence why you see only 1.87 months supply of inventory. Even the $1 Million+ price range saw a shrink in inventory and an increase in sales. It’s no secret that prices have been rising in SW Florida and now you can see in clear detail the reason why. If you’re a seller it pays to know the inventory levels. If you have a home in the $400,000+ range you may need some extra advertising to stand out from the crowd, and you want to make sure your price is in line as buyers have more choices. You don’t want to price yours and help sell your neighbors home. If you’re a buyer this is useful information as well. It’s easy to focus on your search and see other homes, but when you get a bird’s eye view of the market you can better decide how strong to make your offer and how quickly you may need to step up. In some price ranges you’re not really in competition with the seller. You’re in competition with all the other buyers looking for the most desirable homes in your price range. The real question is, if you don’t get your first choice home, how happy are you going to be with your 2nd, 3rd, or 4th choice, assuming there even are other choices? In some neighborhoods you’re lucky to find 1 or 2 homes on the market. It’s very frustrating missing out on Hot properties. One way to stay on top of the market is to search the MLS at www.LeeCountyOnline.com Not only can you search the MLS for exactly what you want, the system will also email you when matches reduce their price or when new homes enter the market that match your criteria. This helps buyers beat out other buyers to Hot new listings. Posted in Cape Coral, Cape Coral Real Estate, Fort Myers, Fort Myers Real Estate, Southwest Florida Real Estate.Tagged listing inventory, seller's market, SW Florida MLS, Update on Inventory Supply in SW Florida.